Move over lemon, Orange Dream Bars are IN THE HOUSE. I’ve talked at length before about how, while I love my house and my friends here in Sacramento, I really, really don’t want to live here forever. My heart belongs to the San Francisco Bay Area, the ocean, and the fog. It would also be easier for my husband if we lived in the bay area, because there aren’t many IT jobs where we live. Luckily, he’s been able to work from home for the last 10 years, but you never know how long that will last. Also, if I have to live in this heat until I die I might go insane. We stay here because it’s affordable and because our daughter is happy here. She’s settled in a school, with friends, and we don’t want to uproot her. My husband moved a lot when he was a kid and never wants to do that to Jordan if he doesn’t have to. So, until she graduates from high school we just enjoy occasional weekends trips to Half Moon Bay and San Francisco, and we plan how we’re going to win the lottery and buy a house by the beach in 9 years. And, you guys, my husband had the BEST idea last week and I think we can actually make it come true. A tiny living room house: living area, family room, kitchen, bathroom. No loft, just super high ceilings with a pantry stocked sky high full of food blogger props. A master bedroom house: where we’d sleep, with a little sitting area and a bathroom. An office tiny house: Room for two desks, a bathroom, and a loft for guests. And, finally, a guest room/Jordan’s room tiny house: another master bedroom house, for guests. Heck, maybe I’ll even add in a kitchen/photography only tiny house. JUST FOR ME. It’s GENIUS. A village of tiny homes, all on one lot, walking distance to the ocean. I’ll sit on my tiny porch and eat Orange Dream Bars all day long while I live my dream. These bars are super simple to make and they’re so good. If you like lemon bars, you’re going to LOVE these. In fact, I used my lemon bar recipe, but I used orange juice instead! 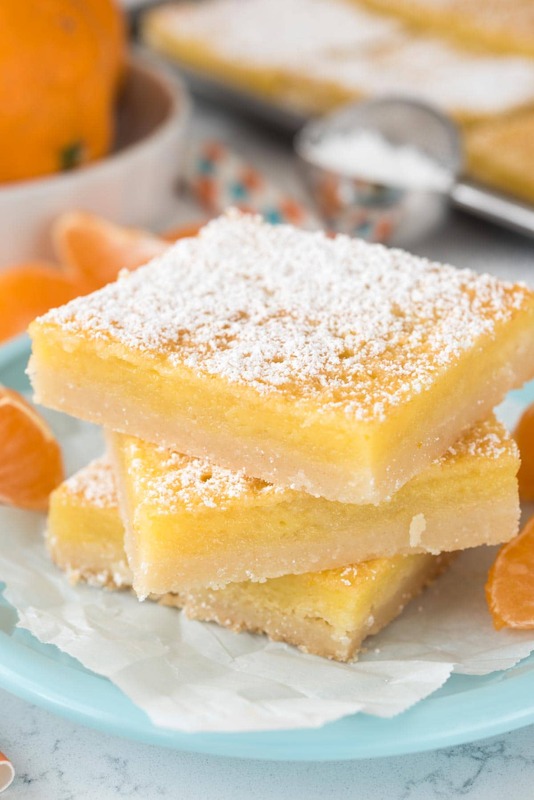 They’ve got a thick shortbread crust, which is super important for any citrus bar. I used fresh orange juice and zest in the filling. The filling is simple to make – you just whisk eggs and sugar and the orange juice and zest and poor it over a partially baked hot crust. Once the bars cook and cool the filling is like a nice thick orange curd. They taste like sunshine and the morning all in one, sun-bursting in your mouth! 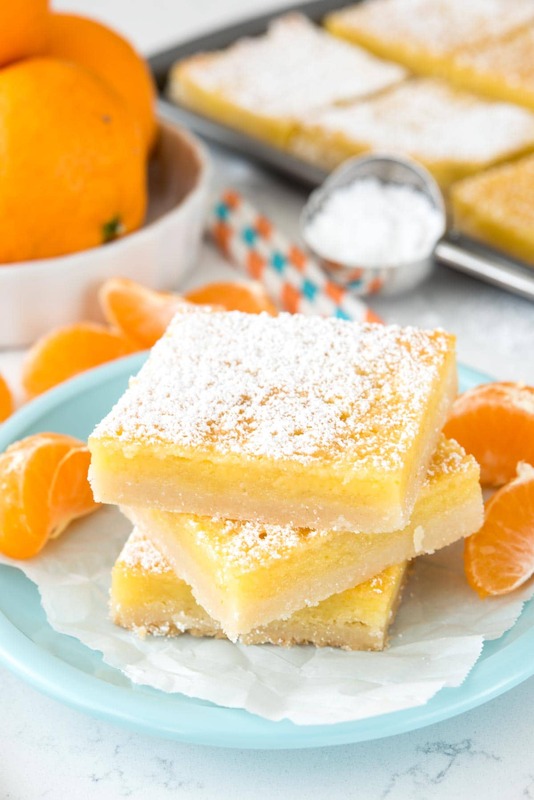 Orange Dream Bars - this easy recipe is like a lemon bar but using orange! 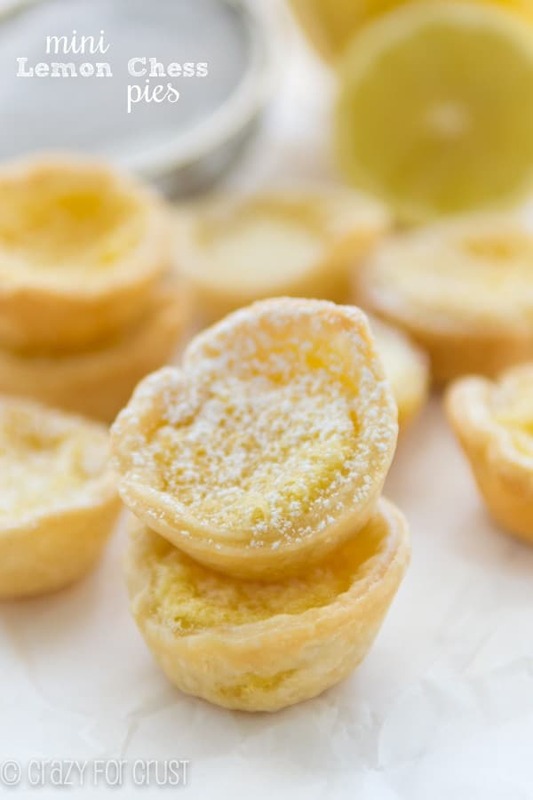 The perfect citrus recipe, tart and sweet with a shortbread crust. 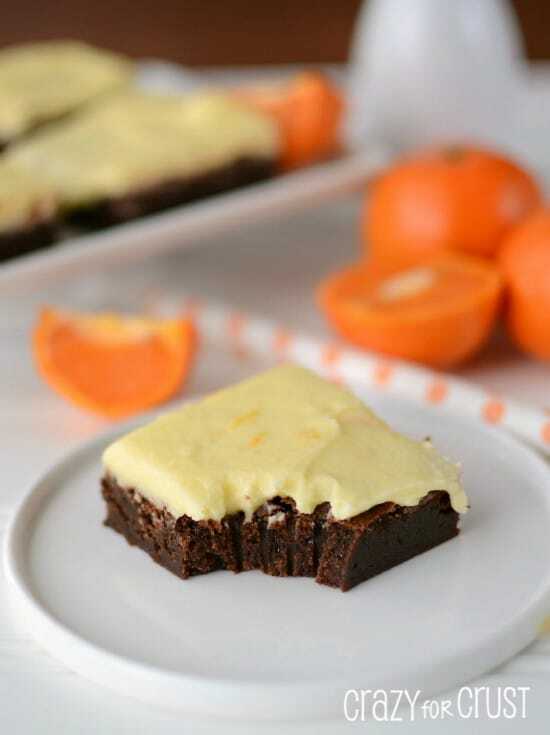 I literally made these Orange Dream Bars tonight. I didn’t need to use any parchment or cooking spray because I used my Temp-tations 9×13″ rectangle baking dish (in Cranberry Floral Lace) and the recipe turned out great! (I did double the filling amounts because I always double the filling in the Lemon Bars too). I also used my Vitamix to mix the filling, which I hadn’t thought of doing until you mentioned using a blender. And I also used cold butter cut up into quartered slices and a pastry fork. The crust turned out nice and flakey (I always use cold butter for crusts). We’re in So. 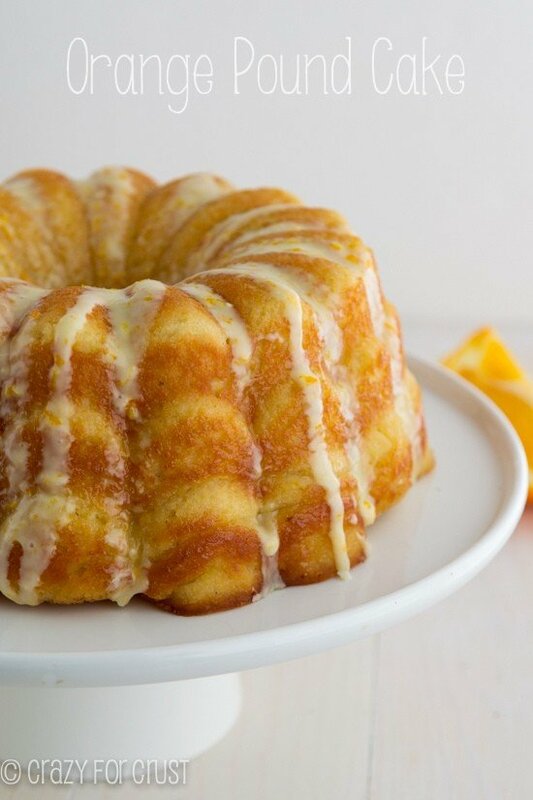 Calif. and have two lemon trees (Meyer & Eureka) and a Valencia orange tree so I’m always looking for new recipes to use lemons & oranges (separately or together). We also have a Gordon Apple tree, but it’s unpredictable when we’ll have a good crop. I suspect the next crop will be good due to all the rain we’ve gotten this winter (thank goodness!). I’ve printed out several of your recipes for lemons (I’m wild about lemons too! LOL). My pastor gives out buckets of oranges from his tree every weekend and I wanted to make something delicious to say thank you. This recipe sounds very delicious and easy to make. Also, your idea of purchasing land and then building the house later may sound “lofty” (pun intended), but it is an excellent idea. My husband and I purchased land in northern California and then ten years later finally built our dream house. We were able to pay cash for the land, so the land was owned free and clear and we were able to use the land value as the down payment on the construction loan. It worked out beautifully. So, I’m here to tell you your 2-part plan to own a home in your dream area is an excellent plan. And, more than that, you have a brilliant idea about building the tiny houses. I wish I had thought about that. I wish you all the success in your dream venture.